The Gloss Coco Bar Stool Black is a superb modern design that will bring a breath of fresh air to any environment. A funky multipurpose piece full of sleek style and easy adjustability, with a Gloss Coco in your interior, the possibilities are endless! 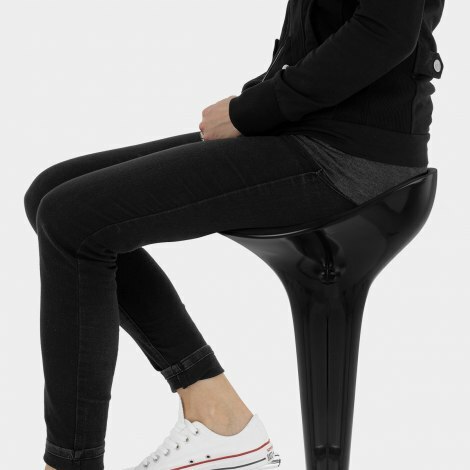 The beautifully formed seat is ergonomically shaped for supreme comfort, and is molded from durable black ABS resin. Its contoured shape tapers downwards in a slender neck until it meets the handcrafted footrest, fashioned from chrome plated tubular steel. Working in unison, the dark glossy finish contrasts beautifully with the chrome column, base and footrest to lend a cool and classy feel. But the Coco is not just about fashion, it’s also highly functional with an adjustable height gas lift mechanism and 360 degree swivel. The sturdy circular base comes with a rubber ring beneath to protect your floor, making it an ideal choice for use in the kitchen, breakfast bar, or as extra seating around the home. "Compact, strong, easy assembly and stylish"
The order was handled efficiently and communication from the company was thorough. Goods arrived exactly on time - compliments to DPD. All components in good condition. I would use Atlantic again if necessary. Bar stools arrived quickly and look lovely. A great improvement to our kitchen! Big thanks to Atlantic staff for sorting our problem out so efficiently ! Quick service, good product. Pleased. Arrived almost before the print on my order was dry. Good quality product, reasonable price. Recommended.